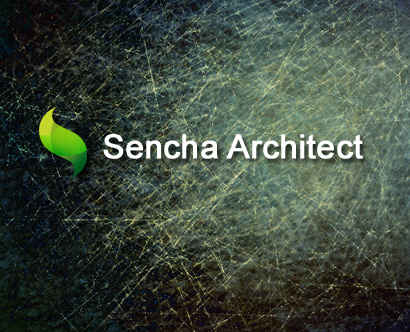 There will be many instances where you don’t want to use the Sencha data model just to store some variables – there are a couple of ways to do so within Sencha Architect that are easy to do. Sure that works in a pinch but lets try to add the desired global variable to the app’s namespace instead. This is essentially just like adding a custom property to any component but in this case you’re going to add it to the application itself. 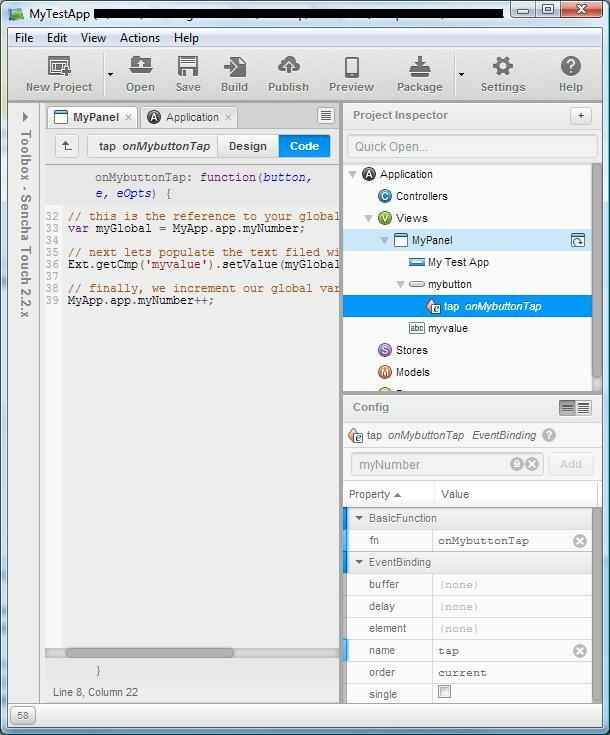 The app is represented by the “Application” root node in the Project Inspector. 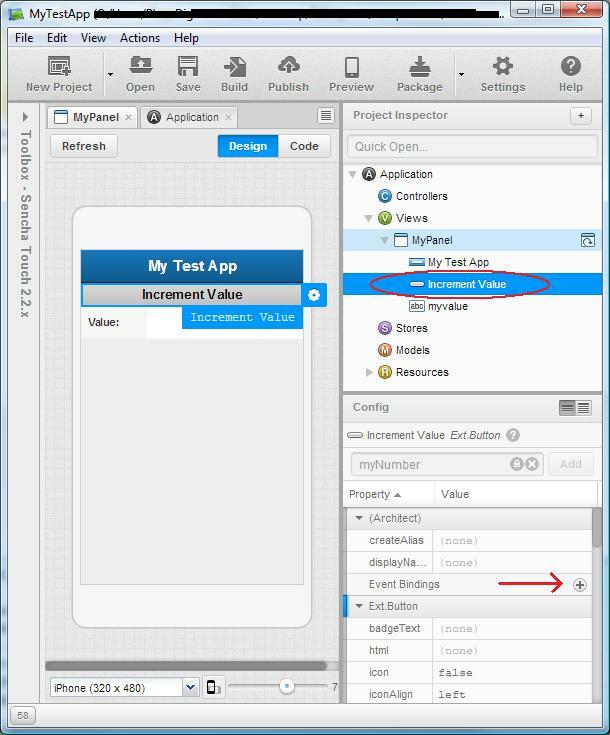 Once added the only issue then is to discover how to reference the “variable” (in quotes because what we’re really doing is adding a custom property to our Ext.application config object). Its not really an issue since as you’ll see its quite simple to determine. You’ve just created a custom property called “myNumber”. Now lets give it a value, in its default state the type of the property is a string as indicated by the icon to the left of the property (a circle with three horizontal dots). We want to change this to a number. Click the icon and select the “number” data type. The type icon should now contain a hash (#). Next, set the value of the “myNumber” property to 0 (zero). You may have noticed the other data types that were available for you to choose from – you can set the value to be an array of strings or objects or whatever may be necessary to meet your particular needs. For now, we just want our “myNumber” property to hold the number 0. Ok, lets start wiring things up. Lets add a simple event to our button. 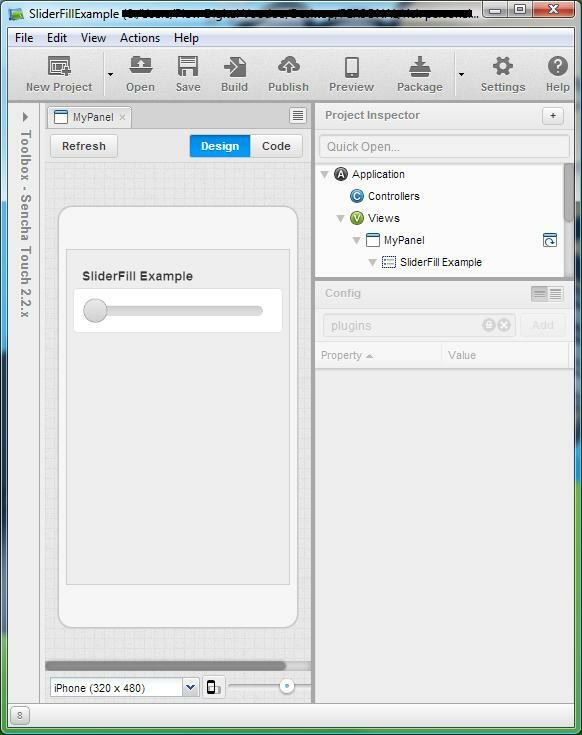 Select the button from the Project Inspector. Its config will appear – click the “plus icon” found to the right of “Event Bindings”. You have bound a tap event to the button. The next step is to add the logic which includes referencing our myNumber “Global variable”. 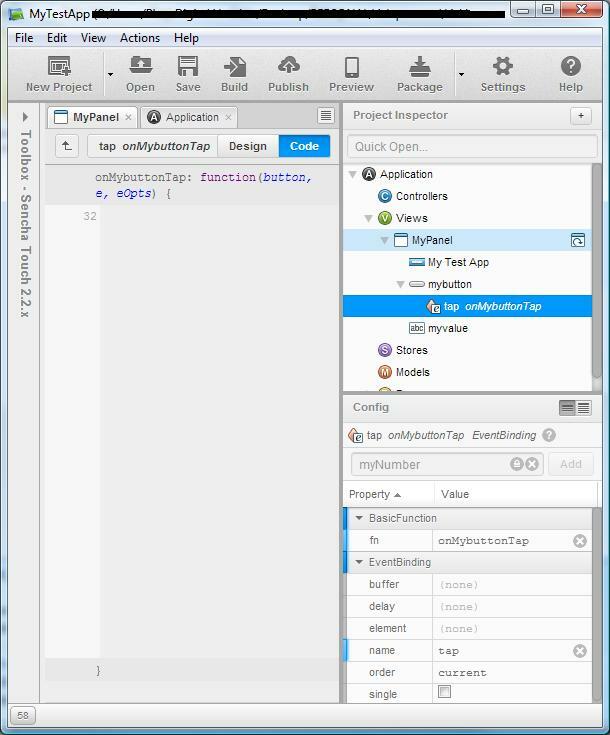 Double-click the tap event beneath the button in the Project Inspector. The code view for the event appears. 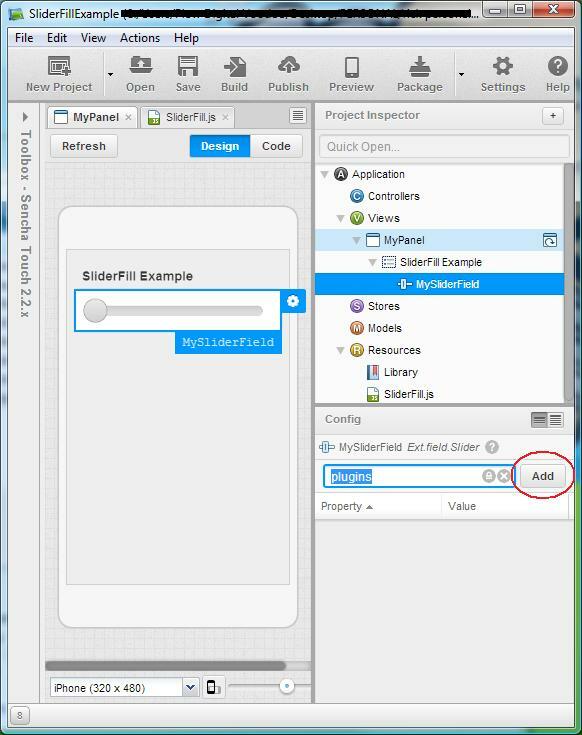 Ok, so this is how we figure out how to reference our custom property – the name of your app can be found in the Application config – click the Application node in the Project Inspector panel and then scroll through the Application Configs until you find the “Name” property – in this case it’s value is “MyApp”. 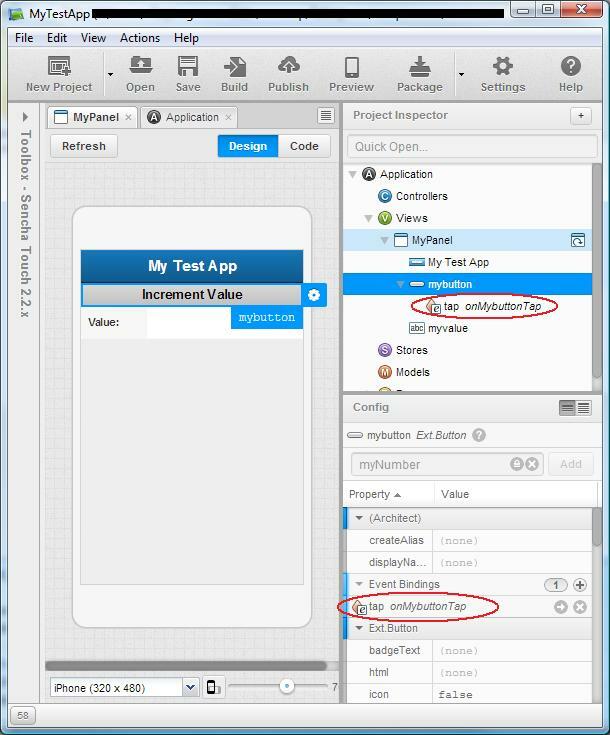 So then, any properties that you add in this fashion can be access via this syntax [ApplicationName].app.[variableName]. In this case it is MyApp.app.myNumber. Note that the new property won’t actually be added unless you give it a default value so be sure to do so to save yourself some frustration. 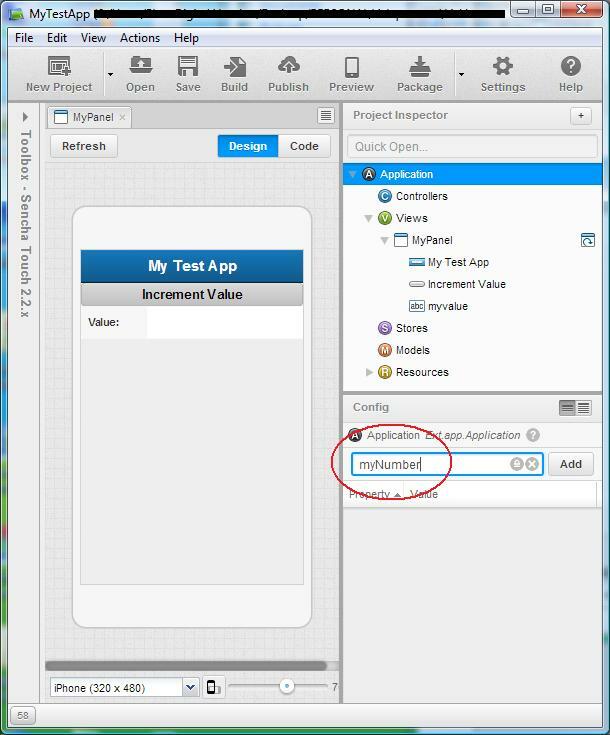 All done, each time the button is tapped we update the text field with the current myNumber value as well as increment the myNumber property’s value. 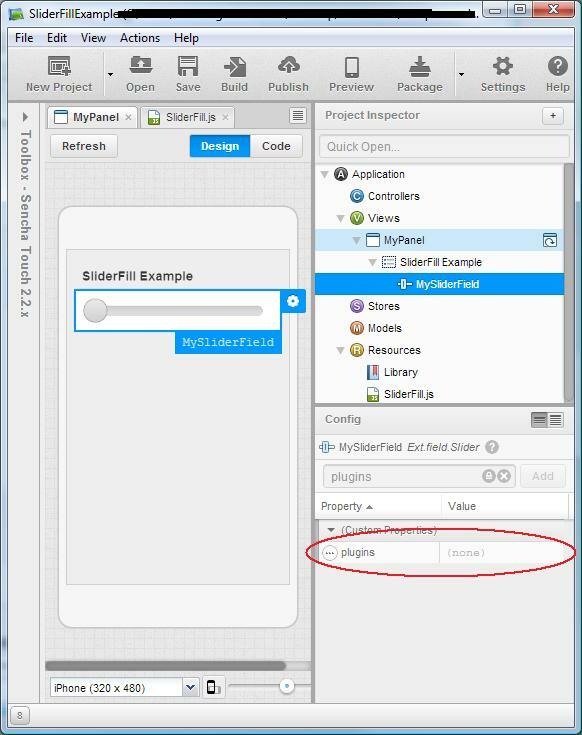 Sliders are pretty cool in Sencha Touch – what makes them cooler is the SliderFill plugin by Thomas Alexander. 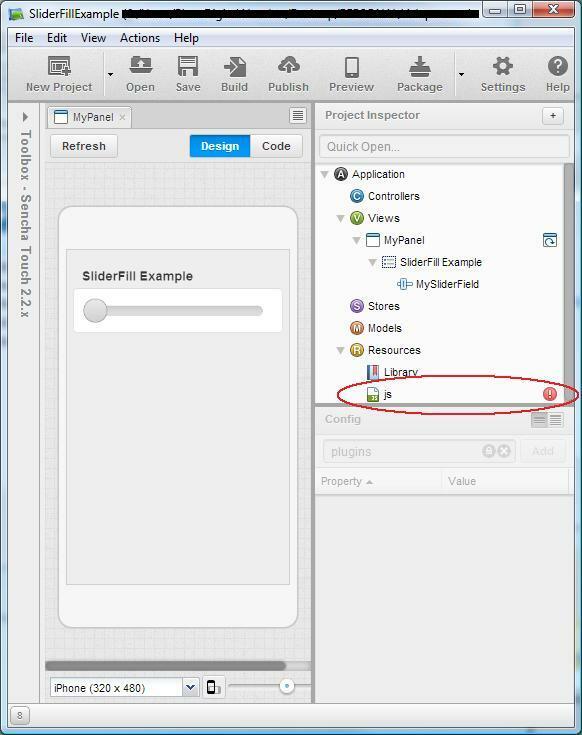 The plugin can be downloaded here: https://market.sencha.com/extensions/sliderfill. 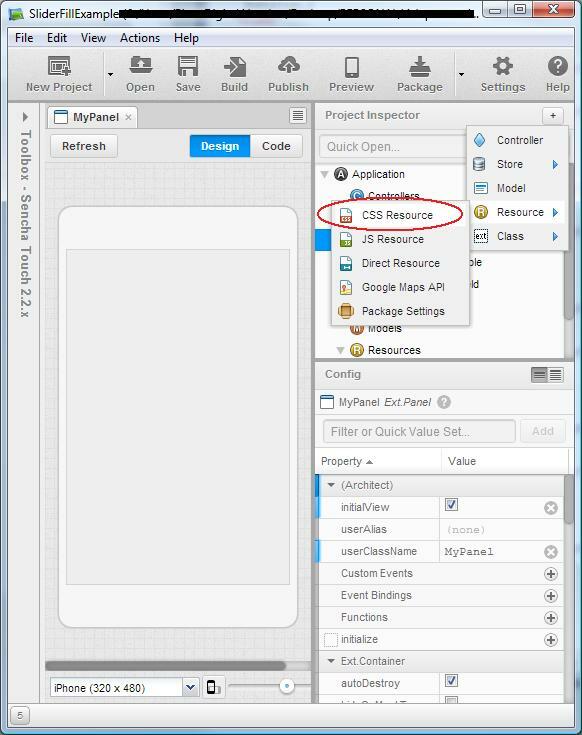 Adding the plugin to your Sencha Architect project is simple – there was one caveat that I encountered – an error within the plugin but it was easy to sort out. 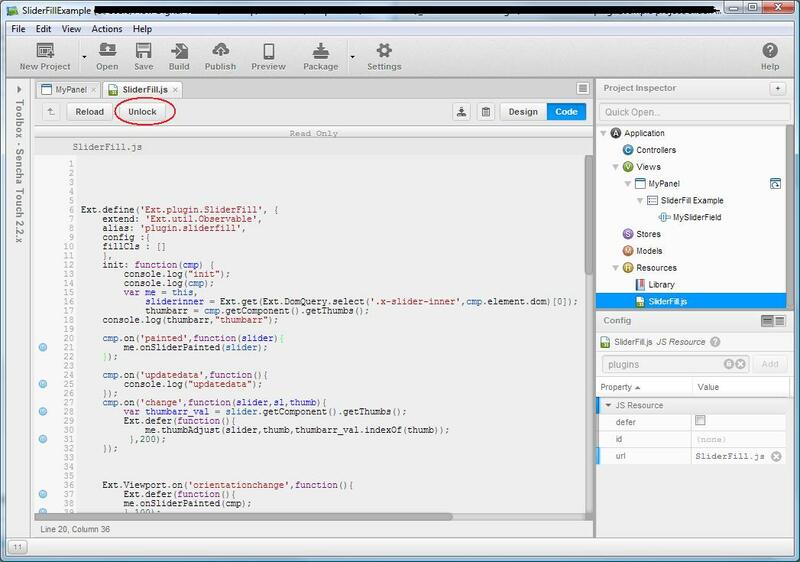 Lets walk through the various steps needed to add and use the plugin within Sencha Touch via Sencha Architect. 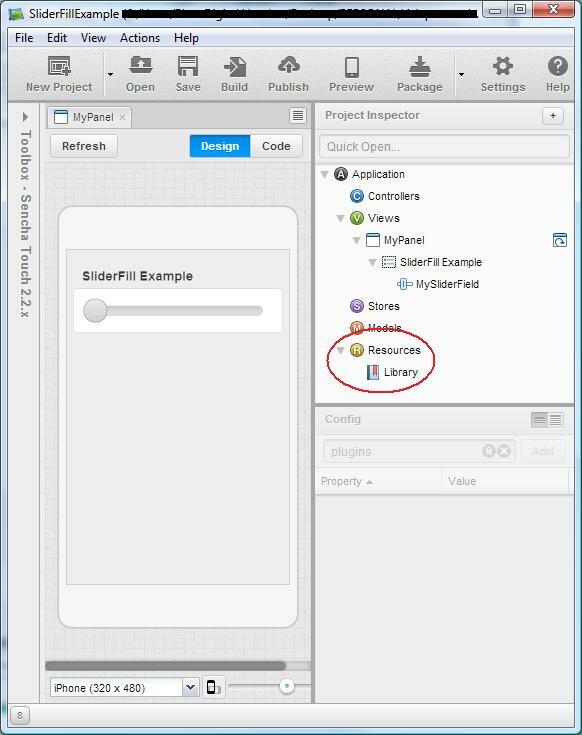 Curiously the README is empty – no worries – within the “src” folder are two files, what you want is the plugin itself which is called “SliderFill.js”. Copy that file and place it within the root of your project, or, if you like, create a plugins folder in your project root and place the file there. For this demonstration I’m just placing it in the project root. 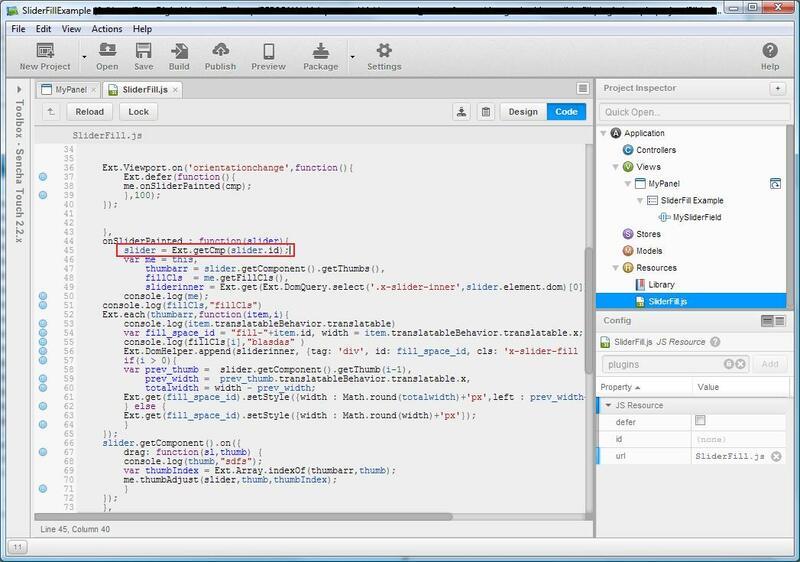 Next you need to add the plugin to your project. Within architect look for the Project Inspector panel – in the screen caps provided here it is on the right. Scroll down to the bottom and look for the “Library” node. Once the plugin is added to the project it will appear as a child of that node. You now have a new JS resource added to your project’s library. You can see a red exclamation indicator nexct to it indicating that it needs to be configured. Select the JS library resource and its config will appear. 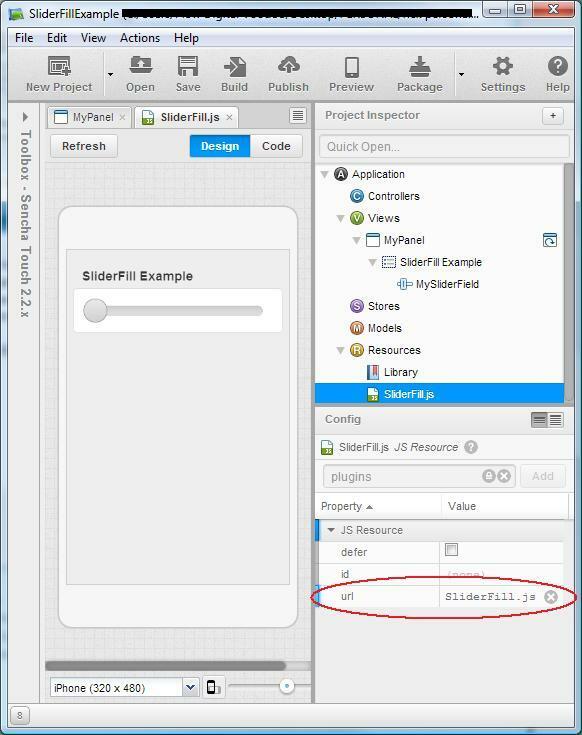 All you need to do is to enter the path to the SliderFill.js file. As I just placed it in the project root all I need to do here is to add the file name. Now that the plugin is installed lets add the plugin to a slider. 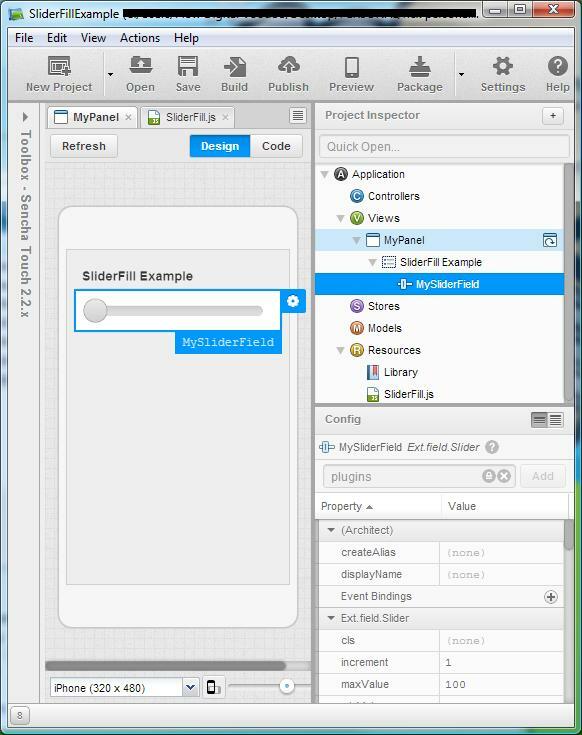 Select your slider from the Project Inspector. Its config options will appear. The plugin property doesn’t exist in the config but we can add and configure it by typing the word “plugins” into the config search field and then clicking the “Add” button to create it. We now have a new custom property within the slider’s config. We now need to configure the plugin. 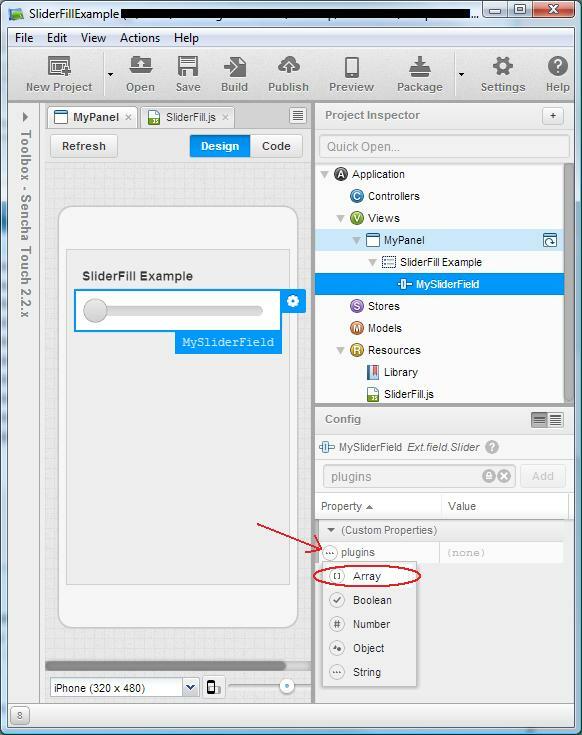 The plugin will accept a configuration object which is comprised of two things: 1)The xclass that specifies the plugin, and 2) an array of class names to apply to each SliderFill background. I have a single slider handle so I’m only going to have a single class. 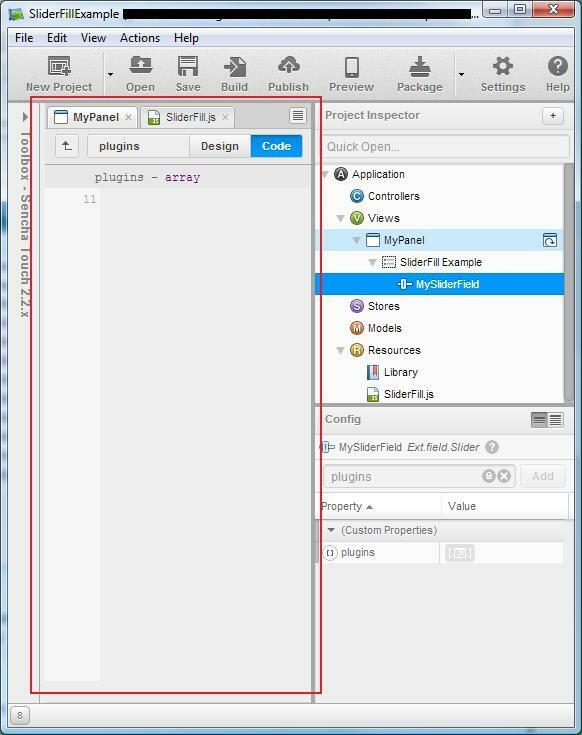 To add the config object click the “Edit” button that appeared to the right of the plugins property when you selected “Array” as the property type. 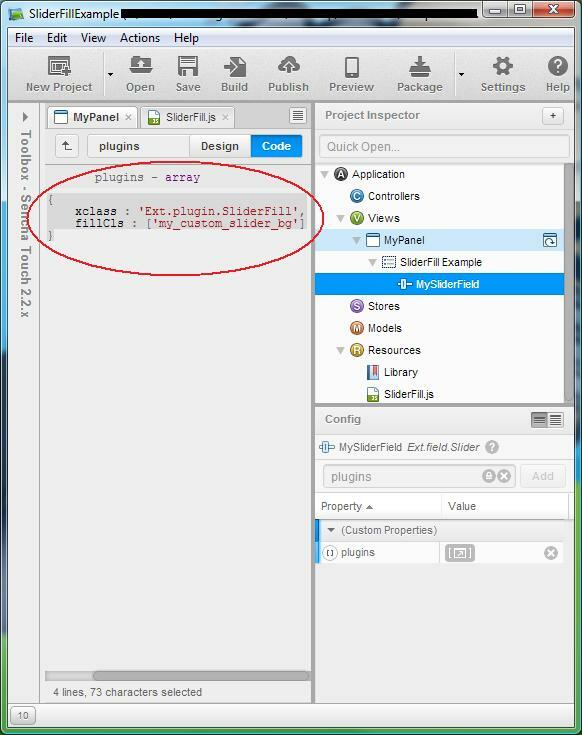 Note that last style – my_custom_slider_bg thats the class name we specified in SliderFill’s configuration object. All that is left is to attach the style sheet. The process is the same as what we did to add SliderFill.js, except this time we will add a Style Sheet instead (note that this is a quick and dirty way of doing things – perfectly functional though if you’re familiar with SASS then you’d likely prefer to do it that way). 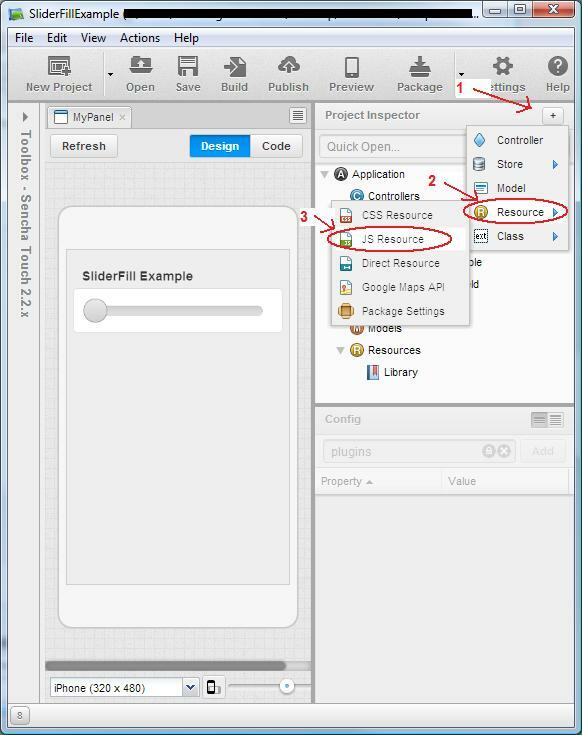 Select the CSS node underneath the Library and enter the path to your CSS – in my case my CSS file is called SliderFill.css. Has your design view in Architect gone blank? 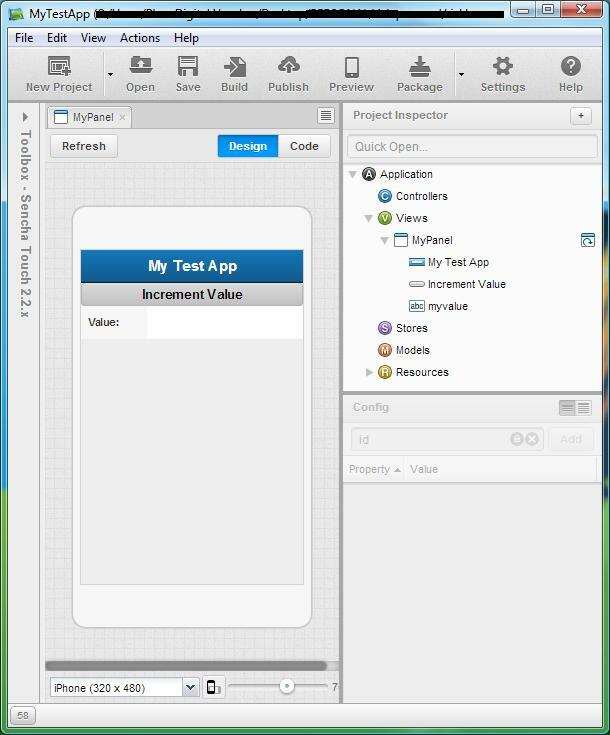 Sencha Architect V2.2.2 has a bug where if you add the plugin attribute to the view config the WYSIWG Design View will become completely blank as you can see in one of the above screen captures. There are a couple of ways around this – the one I think I prefer is to create an onSliderfieldInitialize event in the controller which will apply the plugin to every slider that is initialized within your app. That’s it, now **every** slider that you add will have SliderFill applied to it and Architect’s 2’s Design View won’t go completely blank on you.